It’s all very clear in my head – the reasons we want to be nomads – the changes in our perspective on life after leaving the States over a year ago, and recently realizing that what we do is actually location-independent. Although we’d been reading up on all these wonderfully informative blogs regarding the nomadic lifestyle (see our links on the right), and dreaming of that lifestyle for ourselves, it was never a solid plan that we were actively pursuing…until last week. I spent a couple hours here at a cafe in Berlin, with a friend I haven’t seen in a while, catching up on everything that’s happened since we last saw each other. Never did I imagine that what we were planning on doing would be so hard to explain, or that I would be met with such resistance. I started with the explanation of how we’ve been put in a position, completely out of our control, where we’re forced to make huge changes in our lives, and how we’re excited and energized by the adventures that lay ahead. Her immediate reaction was to ask me, in quick succession: What are you thinking? How could you leave Berlin (“but it’s BERLIN!!!”)? Are you guys craaazy? Won’t it be so stressful to move so often? What about your friends? Then, nothing but open-jawed stunned silence. Said friend and I having lunch...the photo couldn't be less flattering. I tried my best to explain that, up to this point, we’ve been spending everything we earn just to cover our living expenses each month. We spend too much time and energy stressing over what we need to do to earn more money to be able to do the things we want and love to do, mainly travel. We live in an apartment that’s way too much space for us to inhabit, let alone one we can afford to furnish, and it’s the perfect time to make a change to a better life for ourselves. 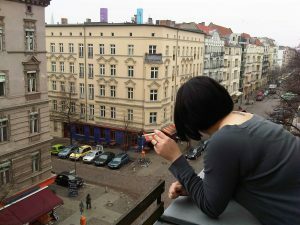 I then explained that, although we do love it here, we’ve decided against staying in Berlin, because from what we now know, we could be spending much less money for so much more life experience, living in other places around the world. I was met with the argument, “…but Berlin is one of the cheapest cities in Europe!” While I can’t argue the fact that many things here are much less expensive than we were used to paying in the States, the rent in this city is gradually rising, and in our research we’ve been finding many fully-furnished (and even some full-service) apartments around Europe and elsewhere that are as much as a quarter of the cost we currently incur. “Stressful,” to me – I explained – is stressing about paying rent/taxes/health insurance/bills/groceries. Stress is trying to sell all the “stuff” we’ve accumulated in the past year. What is not stressful, is trying to figure out what city we want to move to next. Life is, and should be, an adventure, amiright? To some, yes, the idea of this lifestyle is completely crazy. To people who think that traveling costs too much money, I say PISH POSH. It’s all about knowing where to go, and how to stretch your budget to its fullest potential, spending as little as possible. Some people need a “home,” with lots of “stuff.” To each their own, I say. We aren’t the type of people that need things. We need experiences, most of which cannot be acquired by staying in one spot. We are open to all cultures, and all lands, and if we find a place we love, maybe we’ll stay longer. If we end up in a place we don’t like very much, we can always leave. It’s just that easy, and there are just so many choices. We don’t plan on losing any friends, which is precisely what I told her when she asked. People that choose to end friendships over this are no friends of ours. Also, it’s the day and age of technology. We have a US number via MagicJack, so we can easily stay in touch with family and friends in the States, and a Skype account so we can video chat with our friends around the world. Just because we’re constantly on the move doesn’t mean we won’t be just as easily accessible as we are now. And, actually, now that we have this blog, it’ll be easy for everyone to keep up with what we’re doing. The turning point for her, I think, was when I told her that when we’re able to spend so much less money, we’ll be able to afford to come back to Berlin to visit, or meet up with her in…oh…Paris, or Spain, or wherever. Also, no matter where we are, our friends are always welcome to come visit us. After promising her that we were not falling off the face of the Earth, she’s now excited that she’ll have somewhere exciting and different to vacation. All in all, it was a great conversation, and a valuable lesson on how to deal with future resistance or disapproval of the choice we have made. I’m a bit surprised that I survived the interrogation; but I did…and in the end, I was heard. Not having the strongest of family ties, I will say this: it was a lot easier for me to set out on this lifestyle than it is for those who have a lot of local emotional attachments. However, I’ve been blessed in my travels to meet a lot of international families as well, but it does depend on the individual. My own parents, for example, think I’m crazy to live in Mexico, which is supposedly one of the “most dangerous cities on the planet” and they think it’s nothing but pot farms and coke mules and warring drug cartels. And while those exist…they are *not* the norm. The same when I was in Bulgaria. Everyone flipped out, told me to be careful of the Mafia, didn’t think Bulgaria had Internet much less a thriving, completely modern culture that’s just been hidden behind the veil for so long its been forgotten…and yet there it is, a completely modern European country with any and every amenity and creature comfort you could ever want and safety levels that surpass the vast majority of the United States. The *only* people the Mafia care about are investors with multi-million dollar projects and politicians. (And anyone who thinks that doesn’t exist in the U.S. is crazy; it’s called organized crime for a reason. Where do people think big business came from?) Everyone else is just normal people. I haven’t really lost any friendships, though. I have gained far more from this lifestyle than anything else. I’ve met people from all corners of the globe, I’ve learned new languages, seen things that most people will never even hear about (I have a post coming up on a hiking trip from Bulgaria later this week; you should certainly post those Playa pics/blog because it’s the memory posts that really bring out the epicness of this lifestyle. Earl had a great post up about the hotel from like 9 years ago the other day that I really enjoyed as well) and basically live a life that the average, ordinary person only ever dreams about while sitting on the couch after work and flipping through the Travel Channel and National Geographic. We, on the other hand, get to LIVE it. And that, for me, is enough. I don’t need things. I need experience. I crave adventure. It is the call of the open road that is my muse, my motivation, my reason for being. Some days I am reminded of what it must have felt like to be one of those ancient explorers, setting out on a journey on a mere wooden boat against the vast openness of the ocean that had never been mapped, unknowing of what was over the horizon. Those guys were bad-asses compared to the modern-day nomad, traveling with GPS and cell phones and Internet and connectivity, but I still like to try and envision the sense of excitement that must have been in the hearts of those types of explorers…and when I feel that inspiration in my own breast…well, there’s a great, wide world to explore out there. And Skype is the best thing ever =P I’ve been using it since the beginning, way back when it was just getting started and only had a couple hundred thousand users. Nowadays it’s for friends family and clients alike, and it doesn’t cost me a dime. Love it! I hear ya on the blood-family ties thing. My parents will probably never see this blog, because they’re not up on their computer game. My sisters live their individual lives, and we don’t speak too often. I’m surrounded by what I consider to be my real family, the one I’ve created for myself and am an active part of, and I couldn’t ask for any more. I just had to write this post because all the previous feedback we’d received when we announced our “big news” was so positive – I never expected that I would need to defend our position, y’know? It’s clear to me that not everyone thinks this is the dream life, but for us, it really is. We’re so looking forward to this life journey. You’re absolutely right about chronicling past travels. We’re also going to need to dust off the ol’ camera and get used to taking tons of pictures again. It used to be second nature, but just kinda fell to the wayside when we “settled” in Berlin. We’re for sure looking into Bulgaria – even more, now, after your last post! Thanks again for keeping up with us! I don’t believe in competition, but rather mutually beneficial working relationships and friendships :) So, with that being said, welcome aboard the lifestyle hehehehe. Anyway…I’ve come across people who hate the thought. I had one writer at a previous forum where I worked who went off on me one time about how a life of continual travel was actually one of shirked responsibilities and tax evasion. My cousin (who has been removed from my Facebook as a result) happens to be a hard-core Air Force career guy and when the family found out that I was living abroad and enjoying the benefits of being a digital nomad he went so far as to label me a traitor to the cause. I was like…seriously? But there are more and more people every year making the plunge, especially as more and more people wisen up to making money online. It’s just the natural evolution of the specials; true globalization. And while it’s slow, it’s happening right now. No reason to be humble, we’re definitely nowehere near what you’ve already done haha. We just started! But I do agree that mutually beneficial working relationships are great, especially when a friendship can coincide with that. I don’t see a problem being friends with colleagues and vice versa, as long as everyone has the right type of relationship that won’t go screwing up either side of the board. Bad friends and bad colleagues must be axed from one’s life. Crazy what you said about your cousin. To each their own, though. Some of the most conservative people I know – or thought I knew – had their lives completely turned upside down after being forced to travel for work or otherwise. They’re now much more liberal in a variety of ways, which I think is a wonderful result of actually getting out and seeing the world. And if anyone wants to bash me, or you, or us, for going out and doing this, they can (insert my extremely vicious and horrifying vocabulary here). I don’t need those people in my life, and clearly, neither do you or anyone else who does what we love for a living and a life. Life’s too short for grudges and people who don’t jive with you. I’m not one to burn bridges, but there is such a thing as agree to disagree and move on…and I’ve had to do that to some degree when traveling, because you meet a lot of strange cats on the road…some of them with VERY strong political affiliations lol. Again, I couldn’t agree more. I hate talking about politics and religion, the standard cliche.